Stood staunch against the sky and all around. Shed beauty, grace, and power. Within it's fold. Beneath was gentle, and the cooling shade. Gave cheer to passers by. It's arms towering. As if to say, "Fear not from life's alarms"
It fell one day, where it had dauntless stood. Paid tribute - - said "To know this life was good. It left it's mark on me. It's work stands fast." This giant oak magnificent and old. • School, 1926, Shenandoah, Page County, Iowa 51601. 1171 Alma Mater Country School, grades 1-8. • Residence, 1930, Locust Grove Township, Fremont County, Iowa, USA. 159 living with his parents. • Military Service, 1941-1945, North Africa. 1173 February 10, 1941 he entered basic training, Camp Claiborne, Louisiana. Lowell was in the invasion at Algiers, North Africa, and had a squad of men at Allied Headquarters in Algiers under Gen. Eisenhower. he was captured at Fiad Pass, North Africa and spent 27 months in German prison camps. 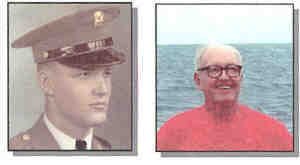 He was discharged from the service on September 5, 1945 at Camp Chafe, Arkansas. • Employment: Shenandoah, Page County, Iowa 51601. 1167 as owner and operator of Lynn Furnace and Sheet Metal. Lowell Lynn, son of Wilbur and Oweata Lynn, was born on the family farm in Fremont County November 2, 1921. He attended Alma Mater grade school and graduated from Shenandoah High School. February 10, 1941 he entered basic training, Camp Claiborne, Louisiana. Lowell was in the invasion at Algiers, North Africa, and had a squad of men at Allied Headquarters in Algiers under Gen. Eisenhower. he was captured at Fiad Pass, North Africa and spent 27 months in German prison camps. He was discharged from the service on September 5, 1945 at Camp Chafe, Arkansas. March 16, 1942 he was untied in marriage to Virginia Book and to this union three daughters were born, Rebecca Ann, and twins Nancy Jean and Joan Louise. They attended the Shenandoah schools and Simpson College at Indianola. Rebecca married Christopher West of Des Moines and they now reside in Louisville, Kentucky. They have one daughter, Jennifer. Jean is married to Thomas Laughlin of Imogene. They have one daughter, Sarah, and live in Fort Dodge, Iowa. Joan married Randall Bird of Garner, Iowa and they reside in Chatfield, Minnesota. They are the parents of three children, Matthew, Adam, and Meredith. • Organizations: Shenandoah, Page County, Iowa 51601. 1167 He was a member of American Ex POWs, American Legion Post #88, VFW Post #7224, and former member of the Shenandoah Masonic Lodge. • Hobbies: Shenandoah, Page County, Iowa 51601. 1167 such as gardening and music (played several instruments). • Cemetery, 27 Jul 2002, Rose Hill Cemetery: Shenandoah, Page County, Iowa, USA. 1166 Lot 90 - following cremation.